There are some charming traditions, like the swallows returning every year to the Mission of San Juan Capistrano. High-level government officials will publicly fret that a failure to increase the limit will produce an unprecedented calamity because the Treasury Department will be forced to default on U.S. government debt, thus triggering a global panic. And this triggers anxiety in predictable quarters. A story in USA Today is representative of the sky-is-falling mentality. Congress will confront a potentially devastating financial crisis in September as lawmakers scramble to…prevent the nation from defaulting on its debt for the first time in history. …The debt limit, set by Congress, is the legal amount the U.S. Treasury can borrow to pay the government’s existing bills, including Social Security and Medicare benefits, military salaries, tax refunds, interest on the national debt, and other obligations. The government has never defaulted on its debt before, and no one knows for sure what the impact would be. However, economists warn that it could plunge the U.S. back into recession and spark a global economic crisis. Paul Krugman is predictably hysterical about the prospect. The odds of a self-inflicted US debt crisis now look pretty good: hard-line Republicans are eager to hold the economy hostage… So it looks fairly likely that by October or so there will come a day when the U.S. government stops paying some of its bills, including interest on debt. How bad will that be? The truth is that we don’t know.. Until now, US debt has played a special role in the world economy, because it is — or was — the ultimate safe asset, the thing people can use to secure transactions with no questions about it retaining its value. …Taking away that role could be very nasty. Even some establishment voices are fanning the flames, including Maya MacGuineas of the Committee for a Responsible Federal Budget. Our economic standing is too sterling and the global economy too important to imperil over the disagreements of American domestic politics — as fundamental as they may be. It is the height of recklessness — a view held for decades reflected in the fact that raising the debt ceiling was once a mundane piece of housekeeping that garnered no attention. It was practically automatic. And Professor Edward Kleinbard of the University of Southern California also thinks the apocalypse is nigh. Sometime in October, the United States is likely to default on its obligation to pay its bills as they come due, having failed to raise the federal debt ceiling. This will cost the Treasury tens of billions of dollars every year for decades to come in higher interest charges and probably trigger a severe recession. …almost all economists and policy makers agree on the enormous fiscal, economic and reputational costs of default. That’s why, in the past, we’ve always managed to avoid it. And I agree that it would be very bad news if the U.S. government didn’t pay all interest and principal to bondholders, as scheduled. But here’s the good news. The odds of that happening are about the same as the odds of me being the keynote speaker at the next convention of the Socialist Party. As I’ve said over the years in television interviews, at press conferences, and in congressional testimony (on more than one occasion), there won’t be a default for the simple reason that the federal government collects far more money than needed to pay all bondholders without any delay. And nothing has happened to the budget numbers to change that analysis. 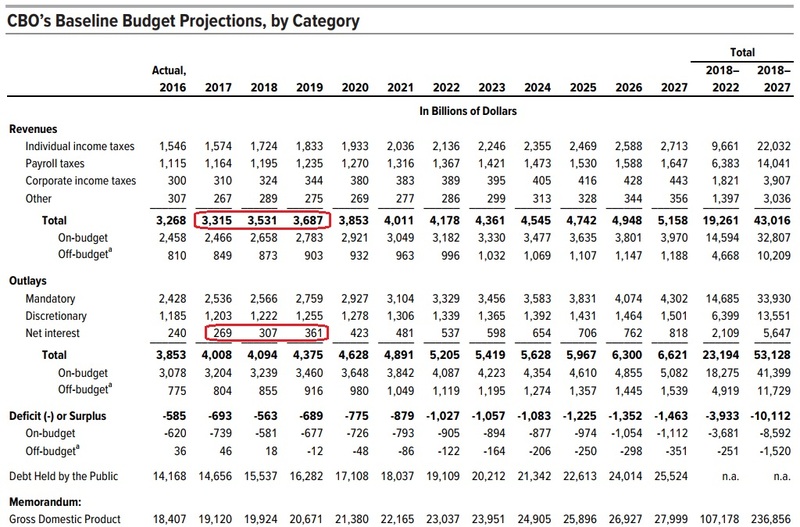 Here are the latest CBO projections on major budget aggregates. I’ve circled total tax receipts for the next three years, as well as annual net interest payments. As you can see, the Treasury will be collecting more than 10 times as much revenue as needed to fulfill obligations to the folks who have lent money to Uncle Sam. By the way, some of you may be thinking I’m a cranky libertarian who is blind to the danger of default. Here’s what the Congressional Budget Office said in its recent report on the debt limit. When Would the Extraordinary Measures and Cash Run Out, and What Would Happen Then? If the debt limit is not increased above the amount that was established on March 16, 2017, the Treasury will not be authorized to issue additional debt that increases the amount outstanding. …That restriction would ultimately lead to delays of payments for government programs and activities, a default on the government’s debt obligations, or both. In other words, the government can choose to pay interest on the debt and defer other bills. As I’ve repeatedly said in all my public pronouncements, a default will occur only if an administration wants it to occur. But that’s not going to happen. Just as Obama’s various Treasury Secretaries would have “prioritized” payments to bondholders, Trump’s Treasury Secretary will do the same thing if push comes to shove. Some budget experts on the left know this is true so they try to blur the issue by stating that it is “default” to postpone payment on any type of government spending. Here’s some of what Kleinbard wrote in his column. …some conservative policy makers besides Mr. Mulvaney have convinced themselves that crashing into the debt ceiling won’t be a big deal because the government can “prioritize” its bill payments, so that interest on Treasury debt will be paid on a current basis, while other bills sit unpaid. Understanding the false allure of prioritization requires a little background. …there are profound doubts as to whether the Treasury could even implement prioritization, beyond ring fencing interest payments, because its payment systems are designed to pay all claims as they are due, regardless of their origin. More important, prioritization is default by another name. The consequences are the same, regardless of which i.o.u.s Treasury chooses to dishonor. All valid claims against the United States are backed by the credit of the United States… The deliberate nonpayment of billions of dollars of uncontested claims every month thus constitutes default, even if the Treasury is paying some of its other debts. The last sentence in the above excerpt is bunk. Postponing or deferring bills is not good budget policy. It’s basically what happens in poorly governed places like Greece and Illinois. But it’s not default. There wouldn’t be any risk to financial markets if the Treasury Department was late in disbursing farm subsidy checks or Medicaid reimbursements. Let’s close by indulging one of my fantasies. If Donald Trump wanted to force good policy from Congress, he could threaten to veto any debt limit that wasn’t accompanied by something desirable such as a spending cap or entitlement reform. The politicians on Capitol Hill would balk of course, but Trump could shrug his shoulders and start “prioritization” once the debt limit was reached. So long as all bondholders received promised payments, there would be no danger to financial markets. By contrast, however, the various interest groups feeding at the federal trough would begin to squeal once their checks started slowing down. At some point, Congress would be forced to capitulate. In other words, Trump has the capacity to score a big victory on the debt limit, just like he has the unilateral ability to score a big victory on Obamacare repeal and/or the 2018 spending bills. I’m not holding my breath for this to happen, but it’s nice to dream. Especially since a big fight over the debt limit today (if successful) could save us from something far worse in the future. Whenever there’s a fight over raising the debt limit, the political establishment gets hysterical and makes apocalyptic claims about default and economic crisis. For years, I’ve been arguing that this Chicken-Little rhetoric is absurd. And earlier this week I testified about this issue before the Oversight and Investigations Subcommittee of the House Financial Services Committee. By the way, when I first showed up, my placard identified me as Ms. Mitchell. Since I work at a libertarian think tank, I reckon nobody would object if I wanted to change my identity. But since I’m the boring rather than adventurous kind of libertarian, I guess it’s good that I wound up being Dr. Mitchell. More important, here’s some elaboration and background links to some of the information from my testimony. America’s long-run fiscal problem isn’t debt. That’s just a symptom. The real challenge is a rising burden of government spending, largely because of demographic change and poorly designed entitlement programs. Measured as a share of economic output, the tax burden already is above historical levels. Moreover, taxes are projected to rise even further, so there is zero plausible evidence for the notion that America’s future fiscal crisis is the result of inadequate tax revenue. International bureaucracies such as the IMF, BIS, and OECD show America in worse long-run shape than Europe, but the U.S. is actually in a better position since a spending cap easily would prevent the compounding levels of debt that are driving the terrible long-run outlook in the United States. It’s good to have debt limit fights today if such battles enhance the possibility of averting a future Greek-style economic calamity. Arguments against using the debt limit as an action-forcing event usually are based on the bizarre claim that an inability to borrow more money would cause a default and wreck the “full faith and credit” of the United States. Nonsense. Treasury would be able to avoid default in the absence of a higher debt limit for the simple reason that tax receipts are far greater than what’s needed to pay interest on the debt. This last point is worth some extra attention. I’ve been arguing for years that debt limit fights are harmless since there’s no risk of default. I even explained to the Senate Budget Committee a few years ago that it would be easy for the Treasury Department to “prioritize” payments to ensure that bondholders would never be adversely impacted. The Obama Administration routinely denied that it was sufficiently competent to engage in “prioritization” and even enlisted the then-Fed Chairman Ben Bernanke to dishonestly fan the flames of economic uncertainty. Well, thanks to the good work of the Subcommittee on Oversight and Investigations, we now have a report outlining how the White House was prevaricating. Simply stated, of course there were and are contingency plans to prioritize in the event of a standoff on the debt limit. I will close by noting the utterly disingenuous Administration tactic of trying to…make it seem as if delaying payments of things like crop subsidies and Medicaid reimbursements is somehow equivalent to default on interest payments. One final point. Let’s imagine that we’re four years in the future and political events somehow have given us a Republican president and a Democratic Congress. 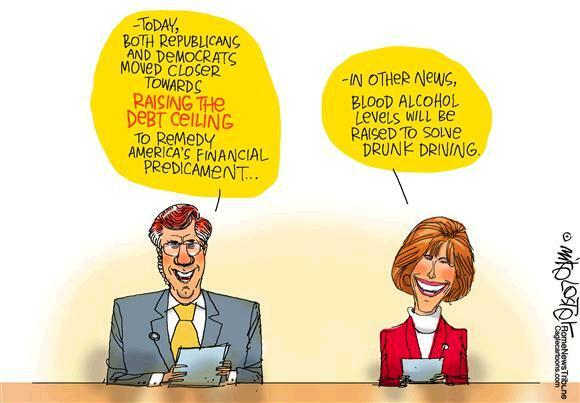 Don’t be surprised if the political parties then reverse their positions and the GOPers argue for “clean” debt limits and make silly claims about default and Democrats argue the opposite. That’s why I’m glad I’m at the Cato Institute. I can simply tell the truth without worrying about partisanship. P.S. Here are some jokes about the debt limit, and you can find some additional humor on the topic here and here. During the 1980 presidential campaign, Ronald Reagan famously said “there you go again” when responding to one of Jimmy Carter’s attacks. That’s because we basically have a repeat of the distasteful 2013 budget deal. The new agreement, like the 2013 deal, busts the budget caps. In this case, the politicians in DC have approved $50 billion of additional spending for the 2016 fiscal year (which started on October 1) and $30 billion of additional spending in the 2017 fiscal year (starting October 1, 2016). Which means that the President gets to further undo his biggest fiscal defeat. And what do Republicans get in exchange? Many of them want higher defense spending, of course, and some of them doubtlessly are happy to have more domestic spending as well. Those politicians are presumably happy, at least behind closed doors. So let’s rephrase the question: What do advocates of fiscal restraint get in exchange? Well, if you peruse the agreement, it’s apparent they don’t get anything. Sure, there are some promises of future restraint. But if the 2013 deal and the current agreement are any indication, those promises don’t mean much. The deal has a handful of back-door revenue increases, including an assumption that the IRS will be more aggressive in squeezing money out of taxpayers. And there are some budget gimmicks, along with some tinkering with entitlement programs, especially the fraud-riddled disability program, that ostensibly will lead to some modest savings. The net result is that we have a pact that leads to guaranteed spending increases over the nest few years, combined with some nickel-and-dime proposals that will probably offset each other in the future. So the bad news – assuming the goal is enforceable spending restraint – is that policy has moved in the wrong direction. In other words, I was right to worry that Republicans would fumble away a guaranteed victory. And this deal probably sets the stage for another bad deal two years in the future since more spending in 2016 and 2017 will make it harder to meet the spending caps for 2018 and beyond. Ooops, there isn’t any good news. About the only positive thing to say is that this new agreement is not a huge defeat. There will still be budget caps, which is better than no spending caps. And the new spending, while wasteful and counterproductive, is relatively small in the context of an $18 trillion economy. Moreover, the deal only partially unwinds the fiscal discipline that already has been achieved thanks to the spending caps. Last but not least, nothing in this deal precludes a better and more comprehensive spending cap, perhaps modeled after Switzerland’s very successful debt brake, once Obama is out of the White House. P.S. This new deal also increases the debt limit. Some view this as a defeat, but it more properly should be viewed as a missed opportunity to get some much-needed reforms. That being said, I can’t resist commenting on the deliberately dishonest scare tactics from our statist friends. They routinely claim that the United States government would have to default on its debt and cause a global crisis unless there is approval for more borrowing. Oh, please, we’ve heard this song and dance before. But it’s utter nonsense. Here’s some of what I said as part of my testimony to the Joint Economic Committee in 2013. …there is zero chance of default. Why? Because…annual interest payments are about $230 billion and annual tax collections are approaching $3 trillion. …there’s no risk of default – unless the Obama Administration deliberately wants that to happen. But that’s simply not a realistic possibility. But some folks may wonder whether my analysis is accurate. After all, maybe I’m some sort of nihilistic libertarian who fantasizes about laying waste to Washington. And other than the nihilistic part, that’s actually a good description of my long-run goals. But that doesn’t mean I’m wrong. So for backup, let’s look at some identical analysis from an ultra-establishment source, as reported in The Hill. Moody’s Investors Service announced Monday that, despite dire warnings from the Treasury Department, the government would find a way to pay money owed on its debt, regardless of whether lawmakers agree to raise the $18.1 trillion borrowing cap. …”Even if the debt limit is not raised, …the government will order its payment priorities to allow the Treasury to continue servicing its debt obligations,” says Moody’s Senior Vice President Steven Hess. Gee, maybe all the mouth-breathing partisans at the Washington Post are the ones who are wrong. Along with the partisan and status-quo voices from the political establishment. Remember the big debt limit fight of 2013? The political establishment at the time went overboard with hysterical rhetoric about potential instability in financial markets. They warned that a failure to increase the federal government’s borrowing authority would mean default to bondholders even though the Treasury Department was collecting about 10 times as much revenue as would be needed to pay interest on the debt. And these warnings had an effect. Congress eventually acquiesced. I thought it was a worthwhile fight, but not everyone agrees. The Government Accountability Office (GAO), for instance, recently released a report about that experience and they suggest that there was a negative impact on markets. During the 2013 debt limit impasse, investors reported taking the unprecedented action of systematically avoiding certain Treasury securities—those that matured around the dates when the Department of the Treasury (Treasury) projected it would exhaust the extraordinary measures that it uses to manage federal debt when it is at the limit. …Investors told GAO that they are now prepared to take similar steps to systematically avoid certain Treasury securities during future debt limit impasses. …industry groups emphasized that even a temporary delay in payment could undermine confidence in the full faith and credit of the United States and therefore cause significant damage to markets for Treasury securities and other assets. 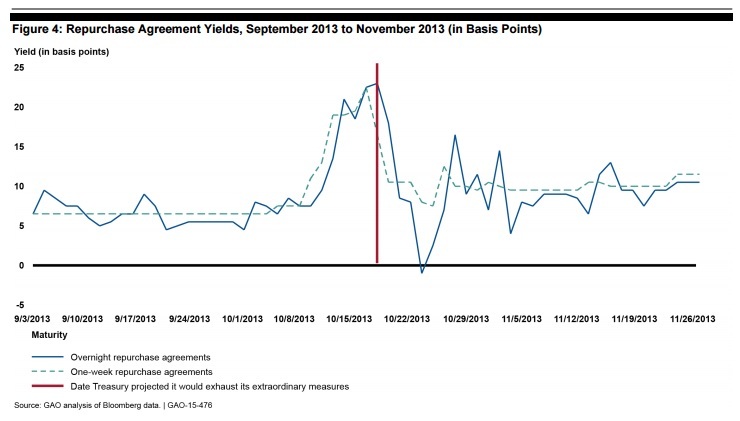 The GAO even produced estimates showing that the debt limit fight resulted in a slight increase in borrowing costs. 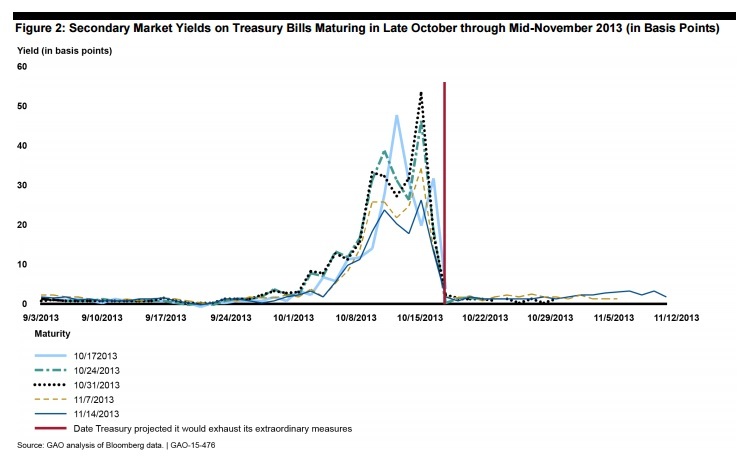 GAO’s analysis indicates that the additional borrowing costs that Treasury incurred rose rapidly in the final weeks and days leading up to the October 2013 deadline when Treasury projected it would exhaust its extraordinary measures. GAO estimated the total increased borrowing costs incurred through September 30, 2014, on securities issued by Treasury during the 2013 debt limit impasse. These estimates ranged from roughly $38 million to more than $70 million, depending on the specifications used. I confess that these results don’t make sense since it is inconceivable to me that Treasury wouldn’t fully compensate bondholders if there was any sort of temporary default. But GAO included some persuasive evidence that investors didn’t have total trust in the government. Here are a couple of charts looking at interest rates. Both of them show an uptick in rates as we got closer to the date when the Treasury Department said it would run out of options. Given this data, the GAO argues that it would be best to eviscerate the debt limit. The bureaucrats propose three options, all of which would have the effect of enabling automatic or near-automatic increases in the federal government’s borrowing authority. GAO identified three potential approaches to delegating borrowing authority. …Option 1: Link Action on the Debt Limit to the Budget Resolution …legislation raising the debt limit to the level envisioned in the Congressional Budget Resolution would be…deemed to have passed… Option 2: Provide the Administration with the Authority to Increase the Debt Limit, Subject to a Congressional Motion of Disapproval… Option 3: Delegating Broad Authority to the Administration to Borrow…such sums as necessary to fund implementation of the laws duly enacted by Congress and the President. So is GAO right? Should we give Washington a credit card with no limits? I don’t think so, but I’m obviously not very persuasive because I actually had a chance to share my views with GAO as they prepared the report. Here are the details about GAO’s process for getting feedback from outside sources. …we hosted a private Web forum where selected experts participated in an interactive discussion on the various policy proposals and commented on the technical feasibility and merits of each option. We selected experts to invite to the forum based on their experience with budget and debt issues in various capacities (government officials, former congressional staff, and policy researchers), as well as on their knowledge of the debt limit, as demonstrated through published articles and congressional testimony since 2011. …we received comments from 17 of the experts invited to the forum. We determined that the 17 participants represented the full range of political perspectives. We analyzed the results of the forum to identify key factors that policymakers should consider when evaluating different policy options. Given the ground rules of this exercise, it wouldn’t be appropriate for me to share details of that interactive discussion. But I will share some of my 2013 public testimony to the Joint Economic Committee. Here’s some of what I told lawmakers. I explained that Greece is now suffering through a very deep recession, with record unemployment and harsh economic conditions. I asked the Committee a rhetorical question: Wouldn’t it have been preferable if there was some sort of mechanism, say, 15 years ago that would have enabled some lawmakers to throw sand in the gears so that the government couldn’t issue any more debt? Yes, there would have been some budgetary turmoil at the time, but it would have been trivial compared to the misery the Greek people currently are enduring. I closed by drawing an analogy to the situation in Washington. We know we’re on an unsustainable path. Do we want to wait until we hit a crisis before we address the over-spending crisis? Or do we want to take prudent and modest steps today – such as genuine entitlement reform and spending caps – to ensure prosperity and long-run growth. In other words, my argument is simply that it’s good to have debt limit fights because they create a periodic opportunity to force reforms that might avert far greater budgetary turmoil in the future. Indeed, one of the few recent victories for fiscal responsibility was the 2011 Budget Control Act (BCA), which only was implemented because of a fight that year over the debt limit. At the time, the establishment was screaming and yelling about risky brinksmanship. 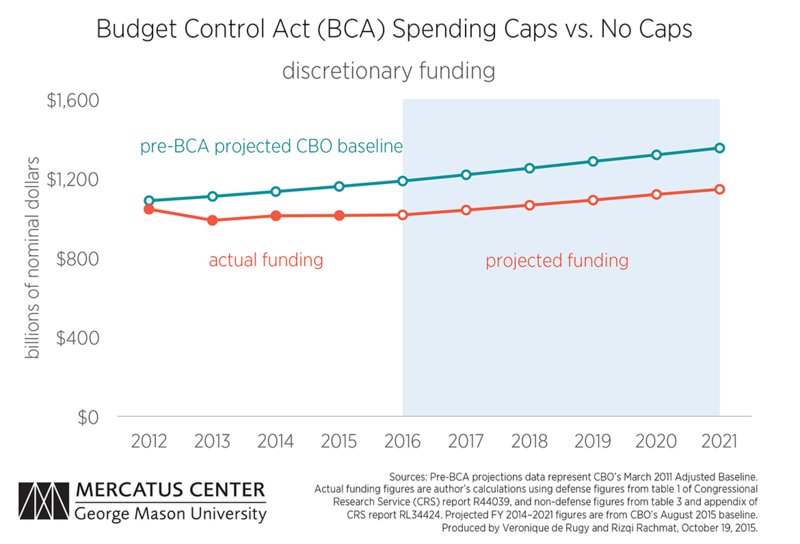 But the net result is that the BCA ultimately resulted in the sequester, which was a huge victory that contributed to much better fiscal numbers between 2009-2014. By the way, I’m not the only one to make this argument. The case for short-term fighting today to avoid fiscal crisis in the future was advanced in greater detail by a Wall Street expert back in 2011. P.P.S. You can enjoy some good debt limit cartoons by clicking here and here. It’s time to puncture the myth that libertarians are congenitally dour and pessimistic. We’re going to look at some fiscal data that must be very depressing for President Obama and other advocates of big government. But that means this information must be very good news for American taxpayers! Here’s a chart looking at annual federal spending since 2000. You’ll notice that spending skyrocketed from 2000-2009 (a time when libertarians were justifiably glum), but look at how the growth of government came to a screeching halt after 2009. Here are some specific numbers culled from the OMB data and CBO data. In fiscal year 2009, the federal government spent about $3.52 trillion. In fiscal year 2014 (which ended on September 30), the federal government spent about $3.50 trillion. In other words, there’s been no growth in nominal government spending over the past five years. It hasn’t received nearly as much attention as it deserves, but there’s been a spending freeze in Washington. Did widows die in the snow? Nope. Did planes fall from the sky? Nope. Did poisoned food plague the country? Nope. Did sick people get turned away from hospitals? Nope. Did the North Koreans take over the world? Nope. 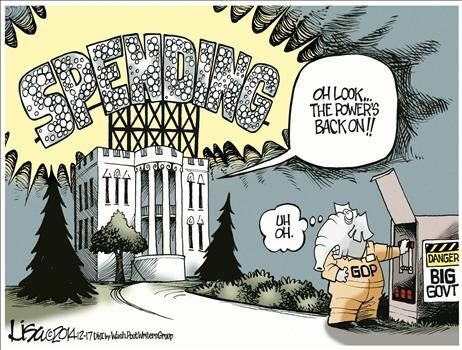 Gee, it appears that spending restraint doesn’t result in chaos. Not that we should be surprised, based on research on “public sector efficiency” from the European Central Bank. So we can logically conclude that spending restraint doesn’t lead to societal disarray. Now let’s look at what does happen when government is put on a diet. 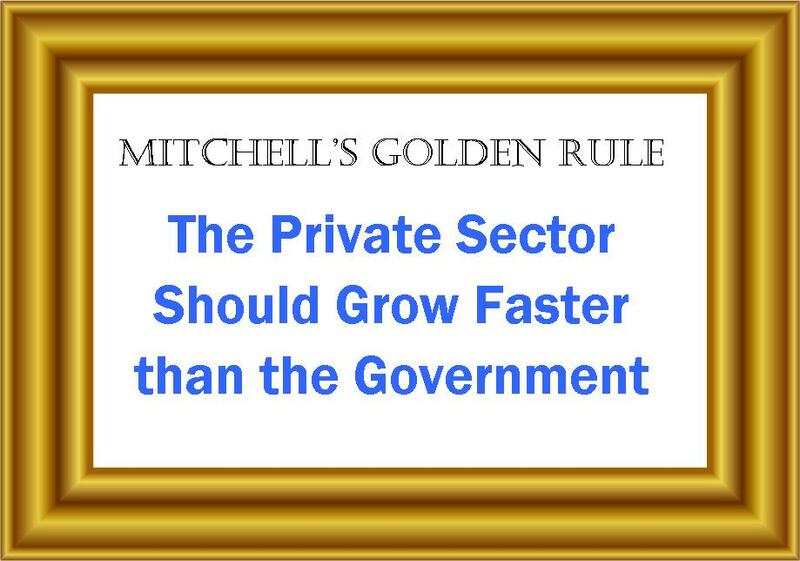 I’ve periodically discussed my Golden Rule, which says that good fiscal policy takes place when government spending grows slower than the private sector. And even though we haven’t had impressive growth during the Obama years, there have been modest increases in both nominal GDP as well as inflation-adjusted (real) GDP. In other words, the Golden Rule has been in effect since 2009. As a result, the burden of government spending, relative to the economy’s productive sector, has been declining. Here’s another chart that will be very depressing for the President and other statists. 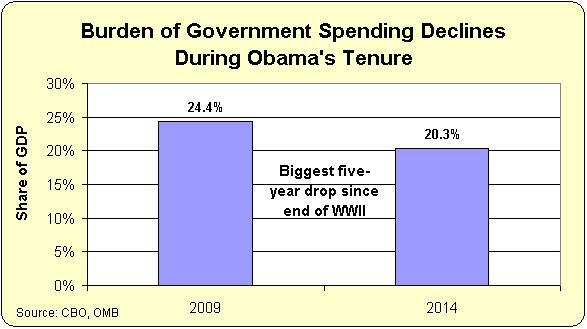 What’s really remarkable is that we’ve seen the biggest drop in the burden of government spending since the end of World War II. At this point, some readers may be wondering who or what deserves credit for this positive development. I’ll offer a couple of explanations. The first two points are about why we shouldn’t overstate what’s actually happened. 1. 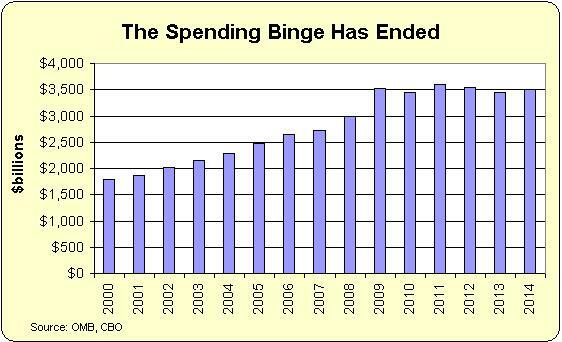 The good news is somewhat exaggerated because we had a huge spike in federal spending in 2009. To use an analogy, it’s easy to lose some weight if you first go on a big eating binge for a couple of years. 2. Some of the fiscal discipline is illusory because certain revenues that flow to the Treasury, such as TARP repayments from banks, actually count as negative spending. I explained this phenomenon when measuring which Presidents have been the biggest spenders. But there also are some real reasons why we’ve seen genuine spending restraint. 3. The “Tea Party” election of 2010 resulted in a GOP-controlled House that was somewhat sincere about controlling federal outlays. 4. The spending caps adopted as part of the debt limit fight in 2011 have curtailed spending increases as part of the appropriations process. 5. 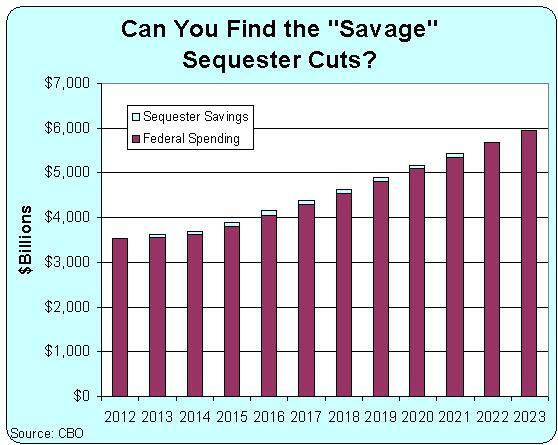 In the biggest fiscal loss President Obama has suffered, we got a sequester that reduced the growth of federal spending. 6. Many states have refused to expand Medicaid, notwithstanding the lure of temporary free money from Uncle Sam. 7. Government shutdown fights may be messy, but they tend to produce a greater amount of fiscal restraint. And there are surely other reasons to list, including the long-overdue end of seemingly permanent unemployment benefits and falling defense outlays as forces are withdrawn from Iraq and Afghanistan. The bottom line is that the past five years have been a victory for advocates of limited government. But now for the bad news. All this progress will be wiped out very quickly if there’s not genuine entitlement reform. The long-run fiscal forecasts, whether from the Congressional Budget Office or from international bureaucracies such as the IMF, BIS, and OECD, show that America will become a European-style welfare state over the next couple of decades in the absence of reform. So let’s enjoy our temporary victory but work even harder to avert a future fiscal crisis. Notwithstanding the landslide rejection of Obama and his policies in the mid-term election, I don’t think this will produce big changes in policy over the next two years. Simply stated, the GOP does not have the votes to override presidential vetoes, so there’s no plausible strategy for achieving meaningful tax reform or genuine entitlement reform. 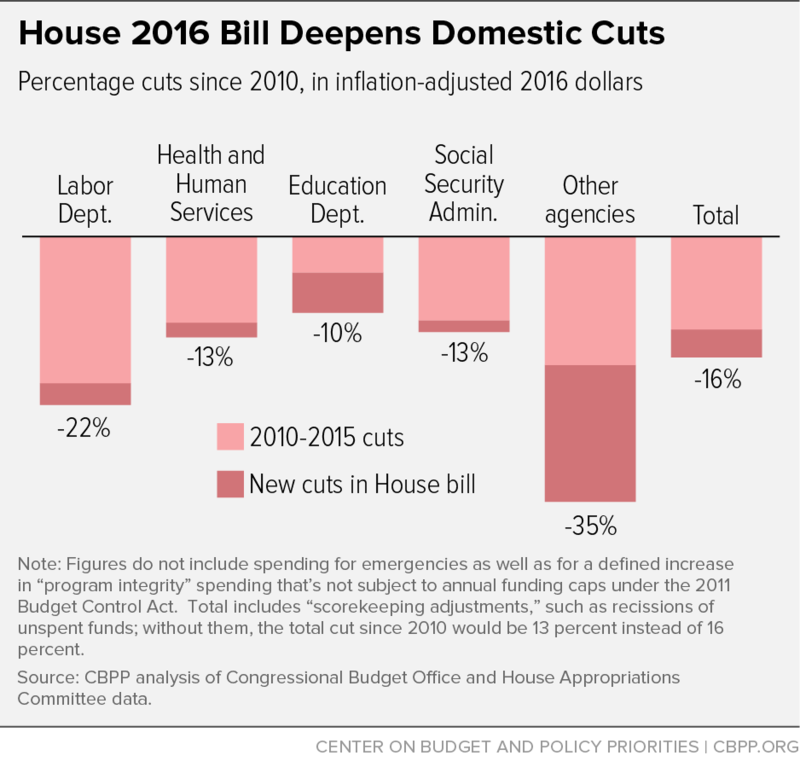 But that doesn’t mean that there won’t be important fiscal policy battles. I’m especially worried about whether we can hold on to the modest fiscal restraint (and sequester enforcement) we achieved as part of the 2011 debt limit fight. Part of that victory was already negotiated away as part of the Ryan-Murray budget deal, to be sure, but there are still remaining budget caps that limit how fast politicians can increase so-called discretionary spending. According to the Congressional Research Service, budget authority for defense is allowed to rise from $552 billion in 2014 to $644 billion in 2021. And budget authority for domestic programs is allowed to climb from $506 billion to $590 billion over the same period. I think that’s too much spending, but the interest groups, lobbyists, cronyists, politicians, bureaucrats, and other insiders in Washington would like much bigger increases. And you won’t be surprised to learn that the Obama Administration also wants to bust the spending caps. This is why I’m very worried that some Republicans are undercutting their negotiating position by saying that there will be no government shutdowns. Let me explain how these issues are connected. At some point next year, Republicans on Capitol Hill will be responsible for putting together spending bills for the following fiscal year. They presumably (or am I being too optimistic?) will put together budget bills that comply with the existing spending caps. B) they can continue to send the President spending bills that comply with the law. But if they go with option B and the President uses his veto pen, then the government shuts down. And even though the shutdown only occurs because the President wants to renege on the deal he signed in 2011, Republicans are afraid they’ll get blamed. The Washington Post reports on this fearful attitude, citing the anti-shutdown perspective of the incoming Senate Majority Leader. A day after he won reelection and Republicans retook the Senate, Sen. Mitch McConnell (R-Ky.) left no doubt… “Let me make it clear: There will be no government shutdowns…,” McConnell said in a valedictory news conference in Louisville. 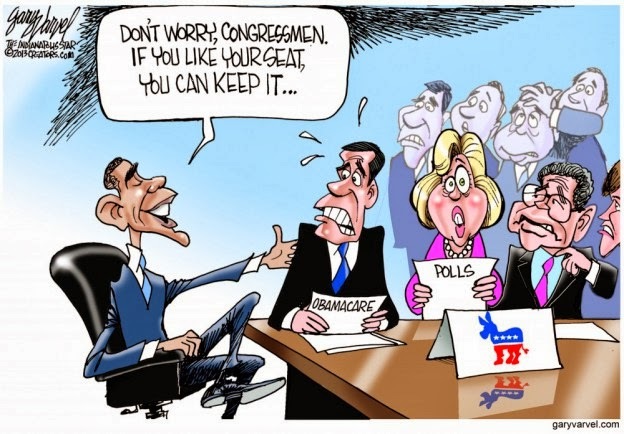 But that view irks some lawmakers who worry Obama will then have a blank check. The first battle may revolve around immigration amnesty, but – as noted above – I’m more focused on fiscal fights. But McConnell could be tripped up by the same conservative forces that have undercut Boehner since he became speaker in 2011. The issue this time is Obama’s expected executive action to overhaul the nation’s immigration system. …conservatives…have urged McConnell and Boehner to fight back by allowing only a short-term budget bill that would keep government agencies open until early next year. These conservatives believe that once Republicans hold both chambers of Congress next year, they can force Obama to accept a budget bill that would prohibit him from implementing his executive order on immigration. At this point in the article, the reporter, Paul Kane, engages in some anti-factual editorializing. …the days of brinkmanship could return with a vengeance, and the government could once again be shut down. That could provide a devastating blow to Republicans, hurting their chance to win back the White House and hold on to their relatively slim Senate majority in 2016. Huh?!? Republicans just won a landslide, so why are we supposed to believe last year’s shutdown was “a devastating blow”? Mr. Kane also refers to a shutdown later in the article as a “fiscal calamity” even though he shows no evidence (because there wasn’t any) that government shutdowns cause any damage. But there is at least one person who is convinced by this narrative. And that person, Senator McConnell, is preemptively trying to convince other GOP Senators to give Obama the upper hand in any fiscal negotiations. McConnell’s advisers are worried enough that by Friday evening they were circulating a memo showing how damaging last year’s shutdown was to the Republican Party — an effort designed to counter conservatives who point to this month’s triumphant election as proof that the shutdown did little damage. …The memo showed that in Gallup polling from late 2012 until this month, …Republicans held steady just a couple of points lower through 2012 and most of 2013 — until the 16-day shutdown of the federal government in October 2013. In just a few weeks, the McConnell chart shows, Republican favorability plummeted 10 points. It has taken a year for it to climb back to where it was before the shutdown. But who cares about “favorability” ratings. The poll that really matters is the one that takes place on election day. And here’s some of what I wrote in my post about lessons that could be learned from the 2014 elections. Back in 2011, I explained that Republicans could play hard ball, largely based on what really happened during the 1995 government shutdown. And in 2013, I again defended a shutdown, pointing out that voters probably wouldn’t even notice that some government offices were closed, but they would remember that the GOP was branding itself as the anti-Obamacare party. The establishment, by contrast, thought the shutdown was a disaster for Republicans. …many…Republicans felt the same way, excoriating Senator Cruz and others who wanted a line-in-the-sand fight over government-run healthcare. The moral of the story isn’t that shutdowns necessarily are politically desirable, but rather that it’s very important for a political party to find visible ways of linking itself to popular causes (such as ending Obamacare, fighting big government, etc). At least one person agrees with me. Jeffrey Lord, writing for the American Spectator, points out the GOP establishment was wrong about the political impact of the 2013 government shutdown. The whole event was giving prominent Republicans in and out of office the political willies. …Republican senators, congressmen, governors, ex-office holders, potential presidential candidates, lobbyists and pundits…were spreading the word. That word? …it was some version of curtains for the GOP. The party would be toast. …they all got it wrong. Not just wrong, but Big Time Wrong. A week ago the Republican Party — barely a year away from the government shut down these folks were bewailing in various terms as bad strategy that “will lose more” for Republicans than Democrats — won a blowout election. …Will Republicans learn anything here? …Do you think Mitch McConnell makes the connection between the government shutdown of 2013 and the fact that he is about to become Senate Majority Leader? To be fair, we don’t know what would have happened if there wasn’t a shutdown in 2013, so maybe the GOP still would have taken the Senate. But there’s also no doubt that the GOP benefited by having a big public fight about Obamacare. Voters didn’t remember the shutdown, but they did remember that Republicans were against the President’s government-run healthcare scheme and they remembered that Democrats were for it. I have no idea whether that made a difference in one Senate race of six Senate races, but Obamacare clearly was an albatross for Democrats. In closing, I want to point out that there are limits to a shutdown strategy. Picking a fight (or, more accurately, refusing to surrender to Obama) in 2015 is almost surely a winning strategy. But having the same fight in October of 2016 probably wouldn’t be very smart, particularly since the establishment press would do everything possible to spin the fight in ways that advance Hillary Clinton (or some other Democrat presidential nominee). In other words, context matters. Pick the right fight. But the bottom line is that Republicans – assuming they don’t intend to acquiesce on every single issue – must be prepared to let Obama veto spending bills and shut down the government. Returning to the American Spectator story, Ted Cruz may not be very popular with some of his colleagues, but I think he made an unassailable point about what happens if the GOP unilaterally disarms. P.S. One reason why Republicans are skittish about shutdowns is that they think they last the 1995 fight with Bill Clinton. But if you lived through that battle (or if you look at contemporaneous news reports), it’s clear the Republicans had the upper hand. P.P.S. Here are the five lessons I shared immediately after the 2013 shutdown fight. P.P.P.S. If you want to enjoy some shutdown humor, click here, here, here, and here. And if you prefer sequester cartoons, click here, here, here, here, here, and (my favorite) here. …Well, I’m not sure what it means. But it sure doesn’t make sense when you look at the big picture. A credit card company wouldn’t increase a deadbeat’s credit limit, so why is it a sign of fiscal prudence to give Uncle Sam more borrowing authority? That being said, I never thought it was realistic to block a debt limit increase. Indeed, I fully expected an unsatisfactory result. But this cartoon is a pretty good summary of how Washington thinks.